This is a rough mock-up of a design that I doodled in Finland and might redo properly at some point, perhaps as a t-shirt design. Yep. What are those rocks that cats eat? My mum calls them crackalots, but I don't think that's the official terminology at all! Ah haha! 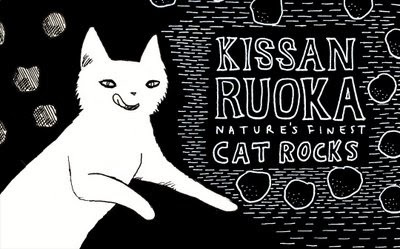 I don't know why I found "cat rocks" so funny but I did! Don't change it! My mother calls them nibbles...but thats not nearly as good.